Chef Don has hosted Monday’s Menu cooking show on WXII for 16 years, appeared as guest chef on many TV shows, including Hallmark’s Christmas with Maya Angelou, Sundance Channel’s Iconoclasts with Dave Chappell and Maya Angelou, and twice on Turner South’s Home Plate with Chef Marvin Woods. 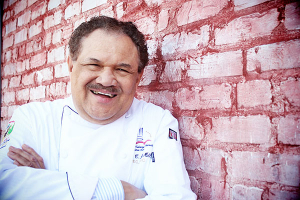 Chef Mc Millan has owned and operated the following restaurants, Gisele Fine Foods, Café Piaf and Café McMillans, all located in downtown Winston-Salem. Simple Elegance Catering founded by Chef Don and helmed by son Andrew, continues to serve the Piedmont Triad community since 1985. Chef Don boasts that he has taught students from every Forsyth County School, not to mention 5 semesters as culinary educator at Guilford Technical Community College. The ACF Triad Chapter Chef and the Child Foundation now instructs at-risk children in the fun of cooking nutritional meals with hands-on instruction at 14 North Carolina counties, now in its 20th year, started and chaired by Chef Mc Millan. Chef Don brings a lifetime of experiences, stories, and travel to over 53 countries, amusing recollections, easy to follow instructions, and just pure fun to his cooking classes.